For the most part, it seems like wireless probe thermometers fall into two categories: inexpensive and somewhat shoddy, or exorbitant and serviceable, but not super special. Until relatively recently, there was no real middle ground in the world of BBQ remote temperature gauges. Well, the remote digital thermometer from Thermoworks, awesomely called the “Smoke” neatly fills that niche—and then some. 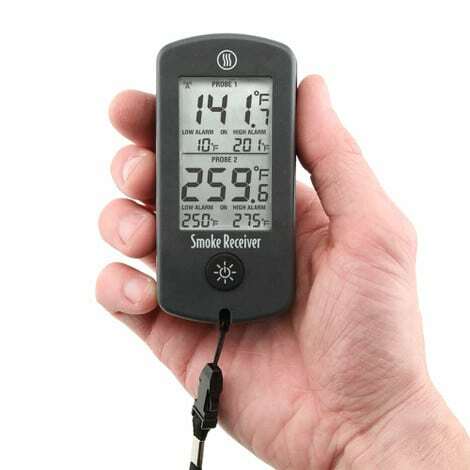 Thermoworks, creator of many great smoker, grill, and food thermometers has done it again. The Smoke is an affordable probe thermometer that’s easy to setup, simple to use, and promises durability. Just what BBQ fans and pit masters need and frankly, have been hoping for. 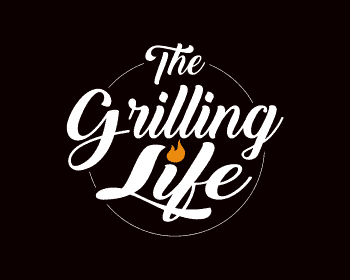 You no longer have to basically pay for a grilling app, rather than a thermometer. Nor do you have to waste your money on uninteresting and questionable probes that can’t guarantee the perfect temperature. 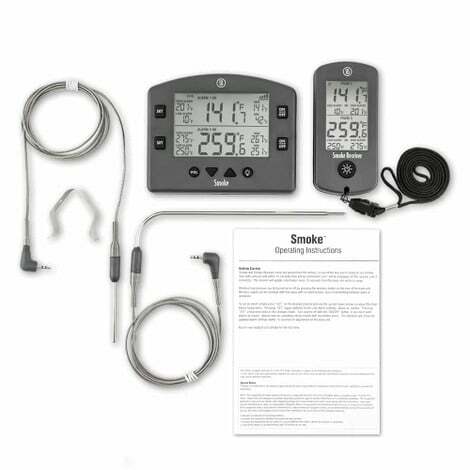 Besides being made by Thermoworks, the makers of the fastest, most accurate and most durable thermometers on the planet, the Smoke has many features that make it incredibly easy and convenient to use. Wireless probe thermometers offer a convenience that cooks appreciate. The versatility of the Smoke is one of many reasons it towers above its competitors—you can use it when you grill, when you slow smoke your meats, or while you cook in a conventional oven. This is one badass thermometer that works just as well indoors as it does outdoors and really shines in both places. Traditional one-time reading thermometers disrupt and slow down the cooking process. Whatever you use to cook on—oven, BBQ, smoker—it has to work harder every time you open the door or lift the lid to check your protein. That results in fluctuating temperatures, which further leads to uneven cooks. You can’t serve a steak that’s rare, medium, and well-done all at once, and try to claim that it’s a creative new technique. Wireless thermometers eliminate that problem, or at least that’s the idea, but many of them are difficult to setup and sync. Others are hard to read. Still, others demand that you stay near the grill or smoker because their transmitters don’t have an impressive range. Furthermore, it’s not uncommon to find a thermometer that can only handle one probe, or that has connectors to two or more but only ships with one of them. Thermoworks’ thermometer deals with all those hassles. Because the receiver and transmitter are paired up right out of the box, there’s no need to waste time syncing the two units. It even comes with its own batteries, which is a small detail, but one that always pleases me. Who wants to spend almost $100 for something that you can’t use until you buy batteries? Thermoworks Smoke believes in simplicity in that way. That may explain why the unit relies on radio frequency connectivity technology (much better in my opinion) rather than Bluetooth connectivity, which is sometimes difficult to pair, connections are easily dropped and has short ranges. Another seemingly innocuous feature that I love is the addition of a down button. Too many programmable thermometers only have an “up” button, so that if you skip past your desired temperature number, you have to start over because you can’t go back to a previous number. That’s a PITA, particularly when you’re ready to throw a piece of meat on the grill. That’s just one of several well thought out and useful features Thermoworks incorporated into the Smoke. One of the things that really sets this thermometer apart from its competitors is the intuitive user interface designed to make its user manual practically obsolete. There’s no trick to using this wireless thermometer. You won’t have to struggle with it after removing it from the box, plus there are clear instructions included. The receiver and transmitter both come with screen protectors that also explain each aspect of the display. You can see where it the screen splits, revealing information about the first probe at the top and showing the readings for the second probe on the bottom. 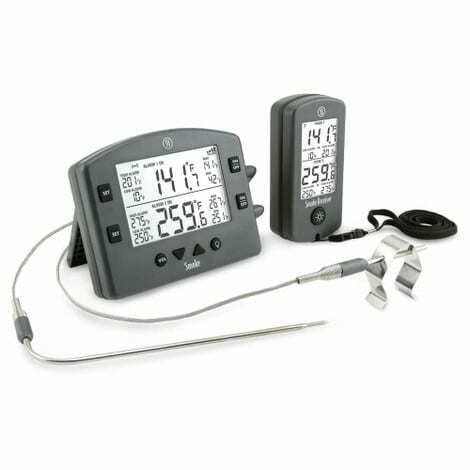 You also receive the Pro-Series High Temp Thermistor Cooking Probe, the Pro-Series High Temp Air Probe, a grill grate clip, a lanyard to hold the receiver, and an instruction manual. Note that the air probe is the shorter one that slides into the grate clip. The cooking probe is longer and bends at a right angle. Connect each probe where you want it to go, then locate the switch on the back of the receiving unit and turn on the thermometer. Protip: remove the battery protectors when you take everything out of the packaging. For each probe, press the “set” button, then use the up and down arrows to set a max temperature. Move on and do the same for the low temperature. With the meat probe, you also pick out the done temperature you want. If you’re using the air probe, thread it through the grate clip and attach it to your grill or smoker grate. Set the alarm to let you know if the meat goes above or below your set temps. Make sure that you can see the temp display on the transmitter as well as the receiver. The transmitter stays near the grill, smoker, or oven, and keep in mind that it has a handy magnet on the back. You can take the receiver with you, up to 300 feet, but if you’re hanging around outside, turn it off and save the battery. The Thermoworks Smoke 2-Channel Alarm Thermometer has a number of features that set it apart from other wireless thermometers on the market. Its ease of use and durability are near the top of the list. It’s a breeze to set the temperature and keep an eye on it, even if you suffer from a temperature flare during your cook. By closely monitoring your meat the rest of the time, you can correct the problem and ensure it doesn’t happen again. The transmitter comes with magnets built-in to the back for easy, no slip mounting on an oven or cool part of your grill. It also has a pullout stand for sitting upright on a side table. The Smoke also has a volume control for alarms. If you have ever done an overnight cook, you know how useful turning down the sound of the alarm can be so you don’t wake up the whole household. You’ll love that the receiver comes pre-paired right out of the box with no set up required. No more troublesome buttons to press or annoying “Waiting To Pair” messages. Your temperatures and alarm settings are displayed on an impressively large display screen and will sound an alarm if the transmission is lost or your preset temperatures are reached. The Smoke’s receiver and transmitter have clear displays that are easy to read. The receivers screen is smaller, but it’s still highly visible at a glance. On the transmitter, the buttons are big as well and unmistakably marked, so you don’t have to guess or hunt for what you want. They both feature large numbers for the current temperatures and smaller numbers for preset numbers. Both transmitter and receiver have a backlight that will stay on for 20 seconds. Not only does the Smoke read a temperature in five seconds or less, but it’s also accurate to an impressive degree—no pun intended. For temperatures that are 248°F and below, it’s correct within ±1.8°F. From 248°F to 392°F, it’s accurate within ±3.6°F. From 392°F to 572°F, the accuracy drops a bit further to ±5.4°F. You can monitor your cook on the wireless receiver up to 300-feet away giving you the freedom to work on side dishes or watch the big game on TV. Thermoworks understands the limitations of Bluetooth connections so they went with radio frequency (RF) for wireless connections instead. I say, Thank You Thermoworks. If you have ever used a wireless thermometer before, you understand the frustrations most people have with Bluetooth. RF connection is much more stable, easier to connect and generally has a longer range. 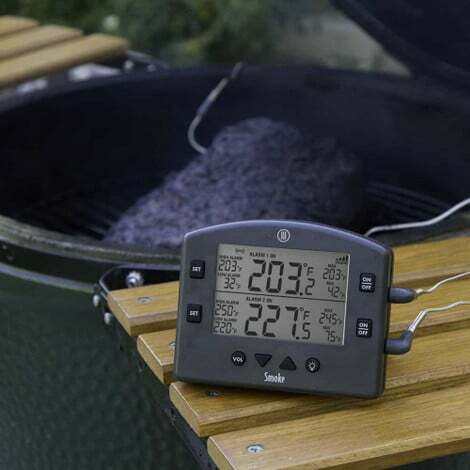 The Smoke comes with two Pro-Series Thermistor Probes: “one for the meat and one for the pit” as they say. The meat probe is very thin and both probes are made from silicon-encased wiring that is wrapped with braided stainless steel. There are strain relief springs on both ends of the wires to help prevent wear and tear, kinking and cinching. These Commercial Quality probes are made for better accuracy, faster response time and longer life than cheaply made competitors probes. A really great bonus feature included with the Thermoworks Smoke is its transmitters ability to pair with multiple receivers so the whole BQ team is covered. It’s as simple as turning off the pairing button, then turning it back on. It always pays to have multiple eyes on the prize when cooking for competitions. The Smoke is rated to IP65. What that means is its transmitters and receivers are sealed for a splash-proof design. Having a water resistant thermometer is useful for many reasons making it safe for outdoor use. No need to worry if your thermometers calibration starts slipping. You won’t have to send the thermometer back to the manufacturer for a tune up like many competitors require you to do. The smoke lets you calibrate from home by putting the probe tips in ice water and pushing a button to return it to its true temp. Everything about this thermometer is versatile. As mentioned, you can use it anywhere you cook, whether you prefer the pit or the grill. You can even roast your meat over an open fire. The ability to choose between the temperature of the air probe, cooking probe, or both is helpful, as well. Who Is the Thermoworks Smoke Thermometer For? 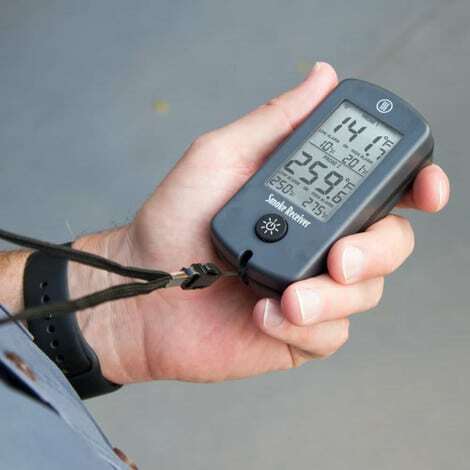 Thermoworks Smoke designed their thermometer for professional cooks and serious grillers and competition BBQ teams. Basically, if you frequently cook, especially low and slow, then you need a wireless thermometer, and this is the one. It has an affordable base price that will pay for itself many times over, even for a first-time buy, and you won’t need to upgrade to anything bigger or better. This thermometer is built to last. Furthermore, if you prefer high-tech grilling gadgets, the much anticipated Smoke Gateway is finally available as an add-on addition. Through your Wi-Fi connection, it brings Internet connectivity to the Smoke thermometer. That may give you the chance to monitor your meat from even further away on any mobile device like your smartphone from anywhere you can get connectivity. You can read more about the Smoke Gateway Here. Something of this caliber might be wasted on a cook who doesn’t smoke or slow cook meat very often. You also won’t like it if you’re not a fan of wireless technology. Remember, though—this isn’t a Bluetooth device. Although the Smoke is my new go-to wireless thermometer, if you are turned off by the price, another great option to check out is the ThermoPro TP20, which will run you about $40 less. The Thermoworks thermometer is available for $99 through the brand’s website. The unit often goes on sale, as well, so you may be able to snag it for $89 or less like I did. Buying it through the website also gives you a two-year warranty for any defective components. You also get a 6-month warranty on the probes and access to the awesome customer service that the folks at Thermoworks provide. For the money, the Thermoworks Smoke thermometer gives you fantastic value. The interface is clear, it’s simple to use, and as long as you keep an eye on the temps, you’ll get the cook you want. All in all, it would be extremely hard to beat this unit even with the higher price than most of the competition. Simply put, this remote wireless thermometer from Thermoworks is easier to use and built with a higher standard of quality. Its probes are more durable, slightly more accurate and will read faster. Finally, the connectivity is easier and better than all others out there. All of this has made the Smoke my new go-to wireless probe thermometer whenever I am cooking, smoking or grilling. I hope this Thermoworks Smoke Thermometer Review was helpful for you. As always, if you or someone you know is interested in remote wireless probe thermometers please consider sharing with your friends or on social media. Sharing is caring my friends! If you would like to leave a comment or have a review of your own to share on the Thermoworks Smoke, please do so below. We always welcome your input and I would love to hear about your experiences with the smoke.